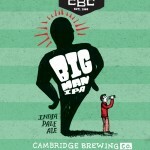 “Nationally acclaimed and locally cherished, the Cambridge Brewing Company has been at the forefront of the Pub Brewery movement since our inception in 1989. Our focuses on high quality craft beers and seasonally inspired New England fare have led to numerous accolades and a devoted clientele. Our desire to exceed guest expectations informs and motivates us daily. Our team of brewers crafts a wide array of traditional, new American and experimental beers styles. We were the first commercial brewery in America to produce a Belgian beer. Our barrel cellar was one of the first of its kind, creating wood aged beers and utilizing micro flora to enhance flavors. Ever had a sake-beer hybrid? You can try one here! Our passion for experimentation combined with our respect for classic world styles translates into an ever changing wide array of beers offered on any given day here at the restaurant. Our kitchen crew understands what it means to cook in New England. Our menu is seasonally driven much like the beers are. Autumn is roast squash, game and tart fruits. Winter is stubborn, hard and requires long braises for bone warmth and deep mahogany flavors. Summer won’t last long yet we have so much to work with, we treat the ingredients lightly so as to let them shine. We source from as many local producers as we can, assuring the freshness of our ingredients and supporting those businesses that are committed to the stewardship of their land and long lasting productivity of our seas. All of this is created and produced in ways that are as earth friendly and sustainable as possible. We strive for zero waste so we recycle and compost everything possible. Our spent grain from the brewing process is used as animal feed by local farmers. All of our lighting is LED, our cleaning supplies are non-toxic, we conserve and re-use water from the brewing process and we encourage our staff to bike to work!